As a leader in the Organizational Context, your primary responsibility is to effectively shape the environment for those who think, feel and work in that organization -- cultivating an environment that is not only financially healthy but also develops the ability and energy of all employees toward a common purpose. Employee passion and #engagement are a key indicator for long-term organizational success. See how to lead from 30,000 feet up with @InspireSoftware:Tweet This! Leadership at the organizational level must be more sophisticated than when you are leading in the Self, One-to-One and Team leadership contexts because there are far more complex issues competing for the mindshare of those you seek to influence throughout the organization and beyond. As an executive leader, it’s important to develop the mindset of having equal responsibility to foster the economic health and effectiveness of the organization through the indirect methods of strategic thinking while ensuring the effective execution of those strategies. While strategic thinking and established processes and policies are your stock in trade, you also need to learn how to shape individual work patterns common throughout the organization yet be flexible enough to meet the unique needs/demands individuals/teams are dealing with through their roles and goals. Organizational leadership requires a strong perspective from the head of the organization. Each part of the strategy must support the rest. While there are challenges organizational leaders should recognize and overcome, there are fundamental indicators to analyze the performance of the company, agency, institution, etc. The Organizational Framework will be essential in analyzing your company. 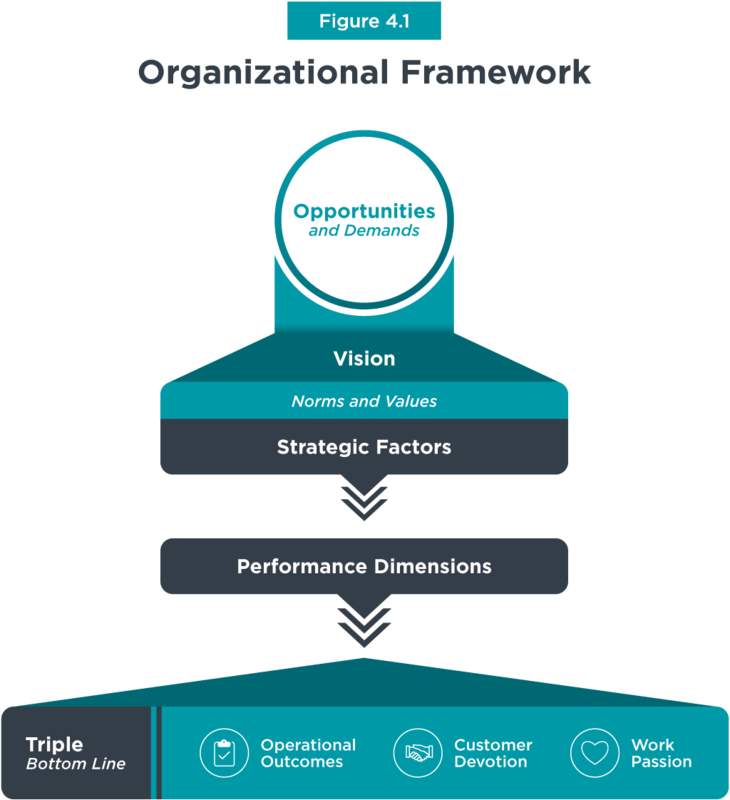 Every company with a clear vision, mission, values and principles, can use a framework to connect their overall strategy with their operational activities. Organizations are created in response to either a demand or an opportunity in a particular market. A demand is something the market desires/needs whether it is lacking a product, service, lower price, etc., and an opportunity acts on something the market greatly benefits from. For example, a company may provide tropical fruit in urban areas needing more agricultural products due to the demand for it. A group of software engineers building productivity software to improve company processes and taking it to market would be an opportunity. Once the organization is created from demands and opportunities in a market, that organization needs to have a clear, compelling and energizing vision. Every organization has a vision to know what the company is and does. It needs to be laid out, so it doesn’t succumb to prevailing forces which stray away from the vision. These could include shifting the focus of the organization to the wrong market, focusing on profits instead of providing for customers or expanding market dominance while losing quality control. If the vision isn’t written in stone and exists as an unwritten idea, it can be shaped and affected by challenges and conditions. The vision is supported by the values and principles of the organization. If the company loses focus of its vision, the values and principles which support the vision will no longer be supporting what the organization originally stood for. Thus, the values/principles will fail to optimize the energy of the workflow of the organization. Once the values and principles support the vision, strategic factors can be looked at. Strategic factors provide the framework for performance including processes, systems and infrastructure to support performance. Performance dimensions include initiatives and goals that determine the day-to-day activities. Challenged by leading your organization to high-performance? Check out the challenges of #leadership in an organizational context with @InspireSoftware::Tweet this! Some of the outputs include a triple bottom line. In the Organizational Context, this includes measuring achievement against organizational outcomes, customer devotion and employee engagement (among financial metrics). These are three important outputs to look at when determining how well your organization is performing. The Organizational Framework can help you determine your performance and see where problems lie. It can ensure your organization maintains its original purpose and doesn’t lose focus. Like the other contexts, there are challenges strategic leaders must overcome in order to align the parts of their strategy. Companies go through life cycle stages and, if not led effectively in an organizational context, and this can lead to failure and sub-optimal employee engagement. These stages of company life cycle stages are infancy, growth, adolescence, primacy, stability, death. Organizations also go through the five Phases of Performance toward achieving business initiatives. Lastly, leaders must recognize there are five critical skills: Understanding the Work Passion of the Organization, Communicating a Compelling Message, Managing Organizational Problem Solving, Promoting Organizational Justice and Celebrating Success, they need to be successful in leading an organization. Many leaders aren’t aware of these stages or what stage their company is in. They fail to ask if their organization is functioning the way it should give the size and level of operation. Most leaders don’t take the time to assess the Phases of Performance that an organization goes through toward achieving a business initiative. Like the Self, One-to-One and Team context, assessing the Phase of Performance are essential to determine what leadership behaviors are necessary for leading in the organizational context. Leaders must develop different skills than in the Self, One-to-One and Team context to be able to lead effectively in the Organizational Context. These skills are very different because you are involving a broader audience and are using certain leadership skills based on the organization’s Phase of Performance for a specific initiative. Also, recognizing yourself as a leader, you need to shift your leadership to make sure you’re using the appropriate skills for the context in which you are leading. 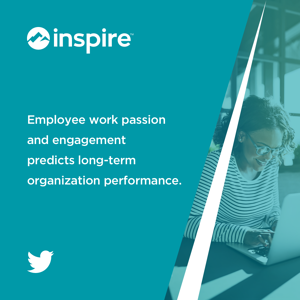 Employee engagement and work passion both predict long-term performance for an organization. When the criteria above are met, organizations can predict higher performance. However, higher organizational performance does not indicate employees are engaged. This is short-lived. In other words, happy employees may indicate higher performance. Just because your company is succeeding doesn’t mean employees are happy. Higher employee passion is also an indicator of high customer devotion. When employees are engaged in their work, they provide a meaningful product/experience for customers. 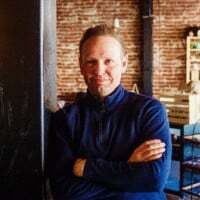 There are strong connections between employees and customers. Better engaged employees put in more work for customers to be happy. However, when financial and economic factors become the indicators of output, the organization can begin to struggle. Leaders shouldn’t lose focus by using these as performance indicators and focus on solely making money. Leaders must master the practices of organizational leadership and learn to respond to the needs of the organization through the various stages of growth it will naturally go through. Having a formalized vision and performance framework helps keep a clear, long-term strategy front and center during the day-to-day operations and execution of that strategy. Overcoming the challenges of lifecycle stages is necessary as leaders move forward, especially when serving their original purpose to serve customers and employees. This can be done by measuring employee engagement, passion and commitment to the organization. Create a workplace where people feel privileged to work and customers feel privileged to use your products and services. Revenue will follow. Organizational Context is one of five contexts in achieving clairvoyant leadership. Read about the other four contexts by getting a copy of Dr. Drea Zigarmi’s book, Achieve Leadership Genius!